Can I take a flight of other Airports but Jeddah & Madina for Hajj? Everybody dreams of going on the great pilgrimage that is Hajj. However, there are great restrictions and strict rules which must be adhered to, to safely complete the annual pilgrimage. One of our readers has experienced one such legality which has troubled him greatly. A reader lost tickets worth $8,000: The reader is asking why he is not able to perform Hajj via Riyadh when the website for the Hajj Ministry clearly states that he can do so. The reader has reportedly purchased the tickets to Saudi Arabia, for a pilgrimage through Riyadh, and has spent above $8000 for the tickets. In accordance with the information posted on the website for the Ministry of Hajj, the pilgrims can enter via Dammam and Riyadh. The website also states that the land inlets include Jadidat Arar, Halat Ammar, Al Ragei, King Fahd Causeway and Al Wadeah. He was not allowed entry: The reader claims that although this has been posted on the official website, the airline which he has booked his flight on has claimed that this is not possible as pilgrims can only enter from Jeddah. The man has asked to spread the word, and help him and others like him who are having difficulty in performing Hajj. You can enter through Riyadh by Road: Another reader has claimed that what the airline is saying is true, as those pilgrims coming by Air cannot come in through Riyadh. However, the responder has also stated that those pilgrims who have made their journey by road can enter through Riyadh. The responder advised the original post writer to ask for another transit location from the airline. He has also stated that the airline has the authority to allow transit without immigration to Jeddah through Riyadh. The original writer has replied to this advice by stating that according to his flight schedule he would not be leaving the airport and only boarding a connecting flight through the same terminal, which has become a nuisance for the intended pilgrim. Pilgrims can enter through Jeddah or Madina Airports only: The airline has posted a letter which they have received from the immigration authorities in Saudi Arabia; “Pilgrims who enter through any flight, but with a foreign passport must enter through Jeddah or Madina only. It is also important to mention here that the restriction does not only apply to the first point of entry. We have written a detailed article on this subject. Recommended: Can I bring my relatives to Jeddah Riyadh or Dammam? 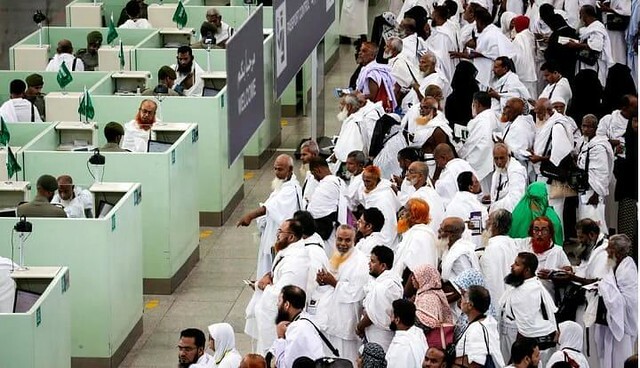 Management of Hajj Passengers: The reasons cited behind this are that Hajj procedure can only go through Jeddah or Madinah so that proper check can be kept on several pilgrims entering the country which is in millions every year. Handling of Hajj passengers is crucial to ensure that nobody is disturbed during their pilgrimage.